Round and round he goes, where he'll end up, nobody knows! 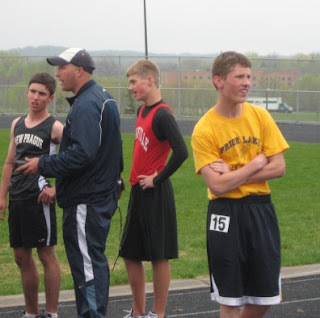 Paul's conference track meet was this afternoon. I went and was dang miserable! It was COLD and drizzly! People were wearing parkas and mittens. I had only a sweater and long pants, but when Jim showed up, he brought a blanket to sit on so my hinder wouldn't be so cold and wet, sitting on the bleachers. 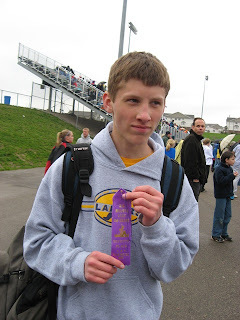 Paul's only event at conference was the 1600 meter run. 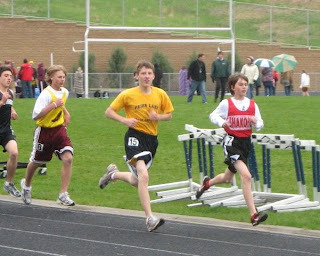 For conference, each school sends only three entrants for each event and Paul was in the top three for his school in the mile. Fresh off my camera's memory card, here are some pictures from his run! (I LOVE DIGITAL CAMERA TECHNOLOGY that allows me to take pictures and post them immediately after kicking Jimmy off the computer). 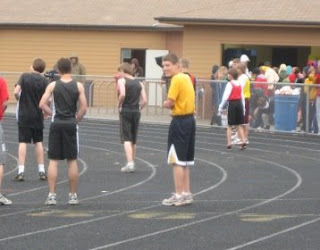 Paul is in the yellow T-shirt. At the starting line, trying to warm up; and his mother is trying to resist the urge to run out onto the track and urge him to put on a jacket. 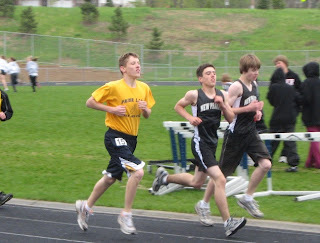 Almost halfway done with the race, he ignores his mother. The end of the race for Paul--he moves up from 8th place to 7th. He looks so old and 'unPaul' when he is running! Please sir, can I have s'mores? Ode to a Grecian Urp. I thought you said, "Weeest."